It is said that the rolling English road was made by the rolling English drunkard, now we know where he emigrated - New Zealand. After a long flight via Dubai and Sydney my wife Anne and I finally arrive in Christchurch, South Island, and head to the hotel to catch up on sleep and a hot bath. Then the excitement really kicks in as we pick up our bikes and meet the other couples on the tour, all American, who turn out to be good companions over the next three weeks. They choose 1150 Beemers whilst I choose a Kawasaki GPZ500. Its performance is more than adequate and it is light enough for me to manhandle. The off-beat liquid cooled twin spins like a crazed top and it will cruise for 250 miles in a day at over 5,000 RPM; a close ratio six speed gear box changes like a flash, not even a tingle from vibration, and the controls, switches and instruments are all well laid out. The little fire engine goes up to warp 3 and brings out the boy racer in me! The first day of our tour begins with a shake down circuit of the Christchurch peninsula, taking in Lyttelton harbour which is formed from a volcanic crater, before heading on to Twizel, a town built originally to serve the construction workers on the hydro-electric power scheme and saved from closure due to its beautiful location. This part of the ride is a blast, as we cross two mighty, glacier fed rivers before heading on to Lake Tekapo, through Burke’s Pass, our first mountain pass of the trip – another spectacular vista - before riding past the turquoise blue water of the Tekapo Canal. 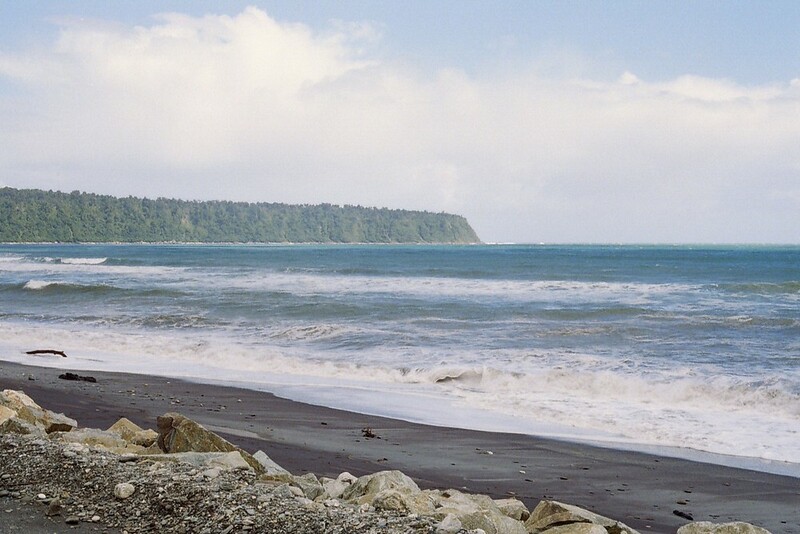 New Zealand’s electricity is the result of vast hydro electric schemes. The lakes are fed by the glaciers and are almost translucent, just tinted by colloidal rock ground down by the glaciers over the last millennium (impressed with my description? – let me tell you, the scenery will run riot with your imagination!). From here we cruise up to the snow clad Mount Cook - it certainly does justice to its Maori name ‘Cloud Piercer’, as at 12,300ft it is New Zealand’s highest mountain. Then it’s on to Dunedin to stay in the very posh Larnach Castle, actually a beautifully preserved Victorian mansion awash in history and scandal. William Larnach was a merchant baron and politician in the 1800s who eventually shot himself and it is said that his ghost is present in the castle. Spooky history aside, Larnach Castle is a magnificent place to stay and a real gem of the Otago Peninsula with its world famous wildlife attractions. If you’ve never seen an Albatross close up, here’s the place to eyeball one! The specialist motorcycle tour company back in the UK (H-C Travel), had provided us with a detailed itinerary for each day with a choice of routes and distances between each stop-over. If your idea of heaven is to rip up the miles along great roads in magnificent scenery, then you certainly have the option in New Zealand. We decided to take the shorter journey each day so we take the 270k route but there is the option of taking a longer one at 470k - the mileages for both options are typical of most days and we had plenty of time’ to cruise or bruise’ the road as the mood took us. We are now in New Zealand’s southern most province, Southland, which boasts the richest sheep farming land in New Zealand in spite of a climate which gives the shortest grass-growing season. Our ride takes us along Highway 1, NZ’ s ‘busiest’ road - think a few dozen cars! From Dunedin south, taking less busy roads as we scatter all over the map and it never ceased to amaze me that we all turned up on time for lunch! We arrive after several hours at the 6,000 acre farm where we are staying for the next two nights. The farm is close to Lake Te Anau on the edge of the Fjiordland National Park. What an education this proves to be – no tourist morsel this but a thriving sheep farmer’s homestead –here is the life of a man who loves his work and is proud of his skill. We get a tour of the farm and a sheep dog handling demonstration. Give me two wheels and the open road any day! The next day is classed as a free day and we take a highly recommended ride to, and cruise on, Milford Sound. 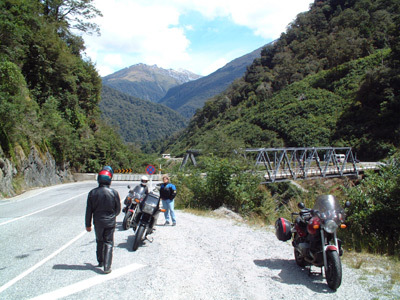 The round trip from Te Anau to Milford Sounds is 238 km, and will take the better part of the day but we would do it again any time as the ride to Milford Sound is beautiful and the fjord must rate as one of the most spectacular places anywhere in the world. I reckon more dramatic scenery can only be found on the Moon. After following the Eglinton River for some distance we enter an impressive forest of beech trees, some over 80 feet tall. I’m impressed with the Avenue of the Disappearing Mountain, an interesting visual trick where the mountain you are riding towards actually grows smaller as you approach it! From Cascade Creek to the Sound you are truly in God’s country. We cruise slowly along to enjoy this part of our ride and the view of the Cleddau Valley and the mountains of Sheerdown Range set a peaceful screen for the twisting ride down to Milford Sound. It would seem that when God has finished the Earth he found that he had a surplus of mountains and fresh water. These he put down in a vacant corner and was so pleased with the result that when man eventually found this place, God fed them a diet of fruit, milk and meat pies to make a race of strong men and statuesque women. This is New Zealand at its best. And at its worst? All NZ roads are decorated with squashed possums and these unloved illegal immigrants would seem to have only one virtue – they make good hats! Seriously, roads in New Zealand are sealed gravel, main routes are two lanes with passing bays and the surfaces are well maintained. And so onwards to the Fox Glacier. 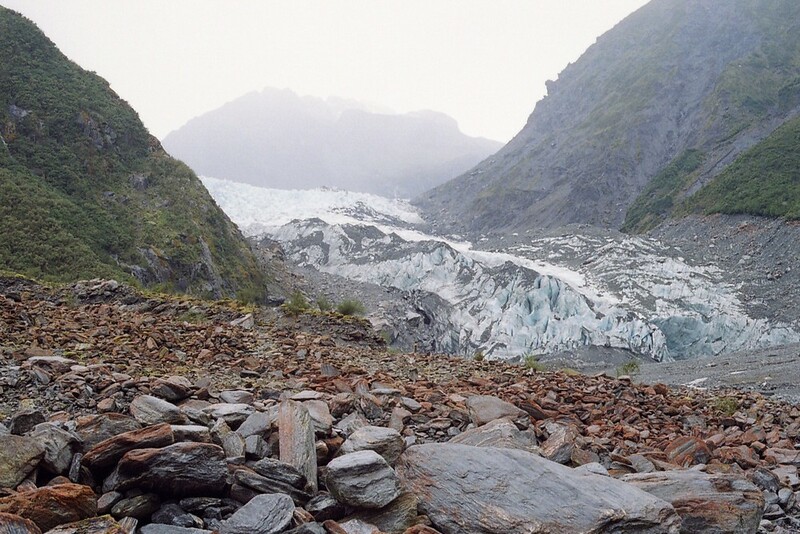 In Maori, Fox Glacier is Ka Koimata O Hinehukatere, or the Tears of the Avalanche Girl. Hinehukatere and her lover, Tawe, who hated the mountains, were climbing high one day when he slipped and was lost. She cries to this day, and her tears freeze to form the glacier. This is a lonely sweeping ride, sunshine all the way. A few miles of gravel road brings us to the foot of the Franz Josef Glacier, the ice descending several thousand feet in a few miles into a sub-tropical forest of ferns and palms. We are staying at Punakaiki for the night, overlooking the famous pancake rocks and sea blow holes where jets of water are shot hundreds of feet into the air. Somehow, I managed to sleep during the best tidal time to view this phenomenon – must be all that fresh air. Our excellent South Island guide, Rex, now leaves us to be replaced by Laurie for the North Island part of our tour. Both men appear to be poured in the same mould of good humoured expertise. We are given detailed information packs which include itinerary, maps and a safety booklet, all reinforced by evening and breakfast briefings. It is difficult to get lost in NZ as the road system is quite simple, having said that, I managed it a couple of times! 1,300 miles on the clock so far as today we ride on through lush forest, the population density increasing but still only a fraction of that in the UK. We reach Nelson, a charming town and if I was fifty years younger, this is the clean and bright place that I would like to live. The desirability of the town is reflected in the house prices, think Surrey, UK. We ride on to Picton to take leave of the South Island and unless you are a fine swimmer, it is necessary to make a ferry crossing between Picton and Wellington. The ferry is a ten deck RO-RO effort and takes three and a half hours for the crossing. The first hour of the ferry ride is down the beautiful sheltered deep blue waters of Queen Charlotte Sound. We then pass through the narrow gap of Tory Channel. Near the mouth of the channel is the old Whekenui Whaling Station. The next two hours are across the open waters of Cook Strait with the final forty-five minutes within the lovely Wellington Harbour. Forested peninsulas and shipping wharves jut into the harbour. I thought it was calm day but promenading on deck becomes a dance, intestines and body in a state of independent free fall. Arriving without my sea legs in the capital, I’m glad to be back on my Kawasaki as we climb up mountain passes on our way to Waipawa on the coast of Hawkes Bay to stay at another farm for the night. This coincides with the sheep shearing – the wool trade is barely economical but still a way of life, so I take my helmet off to the contract team of shearers as they sweat on the stage, girlfriends and wives also perspiring at sweeping, sorting and baling, the whole process not unlike a cheerful hell. The Hawkes Bay district is well known by wine lovers as almost half of New Zealand’s grapes are grown in the immediate area but with a full day’s riding ahead we struck out on the ride to Lake Taupo, the largest lake in New Zealand. I was keeping a note of my fuel as petrol stations can be 100km apart as I drove through the Kaingora forest between Taupo and Rotorua. This is one of the largest man-made forests on earth. A short day of only 50 miles gets us to Rotorua and I realised that the rotten egg smell of the area is caused by the high sulphur content of the steam issuing from the thermal areas. The earth’s crust is so thin here that steam breaks through everywhere. It is possible to sink a hole in the garden and cook your dinner. Several of New Zealand’s native Maori settlements are in Roturua and a visit to a Maori ‘experience’ involves me as the oldest participant being elected as Chief of our visiting tribe. The ceremony includes being greeted by a warrior swinging a club and I have to make a speech as my ‘tribe’ sing a song – I’ve never been so nervous. As the welcome depends on body language, I adopt Prince Philip’s posture of hands behind my back which apparently means “here are my family jewels – I dare you to hit them.” The Maori dances, singing and subsequent dinner will stay in my memory, especially when the host chief shows us the hot stone cooking pit and we are told that if it fails they depend upon a microwave! The next day we crack on to Auckland, which has a third of NZ’s population. It’s a fine city but squeezed East and West by two harbours so that the N&S motorways are the only way in and out. Traffic is very heavy so we took the West side route, and there I was thinking that South Island has the grandest scenery only to discover blue hazed hills and curving bays – you could be in England listening to Elgar’s hymn to the Malvern Hills! Despite a bit of rough running due to a failing plug, the Kwacker always delights and is soon on song again, my own Tiger 100A engine would have exploded by now. 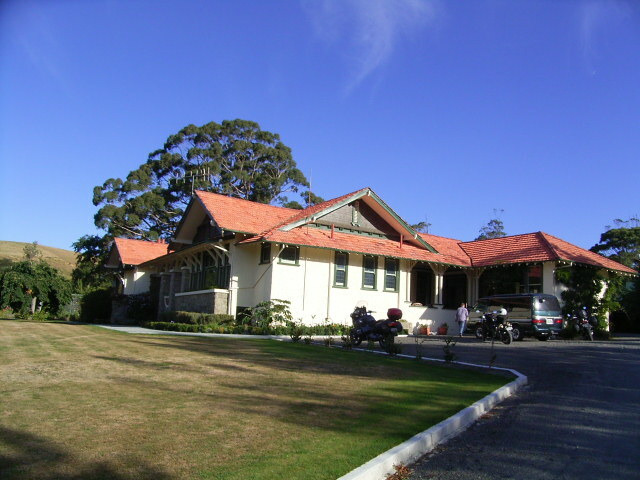 We are now heading to Paihai and the Bay of Islands, and one of the American couples goes for the ‘trophy’ ride to Cape Reinga at the very top of NZ. I’m crossing wooded hills that plunge down to secret seaside settlements, riding through the Waipoua kauri forest, which is the last major remnant of this forest that once covered the northern part of the country. The road suddenly pops out of the forest and after a short spell of farmland I’m treated to some excellent views of the entrance to Hokianga Harbour. The seawall on Hokianga Harbour in Opononi is made from rocks that were used as ballast in the ships sailed by convicts from Sydney, Australia. Glad that period of history is over as I ride east to Kaikohe, Waitangi and into Paihia. 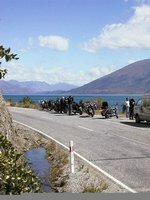 For anyone who is interested, we booked our tour through H-C Travel www.hctravel.com who specialise in long haul motorcycle tours. We used them because they are the only fully bonded and licensed motorcycle tour operator in the UK. We have used them for several trips and they are a great team and all their motorcycle guides are professionals.